Beside the traffic roundabout in the middle of Jeffersonville stands a vacant lot, site of the Bell-Gates Lumber Corporation until its closure in 2002. Two concrete silos remain, relics from the mill's boom years. One of them bears the painting of an incongruous zebra. Created by an anonymous graffiti artist some years ago, this native of the African savannah is barely noticeable, its stripes blending in with the silo's gray. Locals don't seem to have much to say about it. By contrast, a recent proposal to decorate those disused silos has sparked a flurry of conversation. On Jeffersonville's Front Porch Forum, several residents have expressed vehement opinions about a plan to turn the silos into cylindrical murals. Designs for the murals that would greet visitors to this small Lamoille County town haven't yet been submitted, much less approved. But that hasn't stopped some locals from making global objections to the project —objections that others call misinformed. 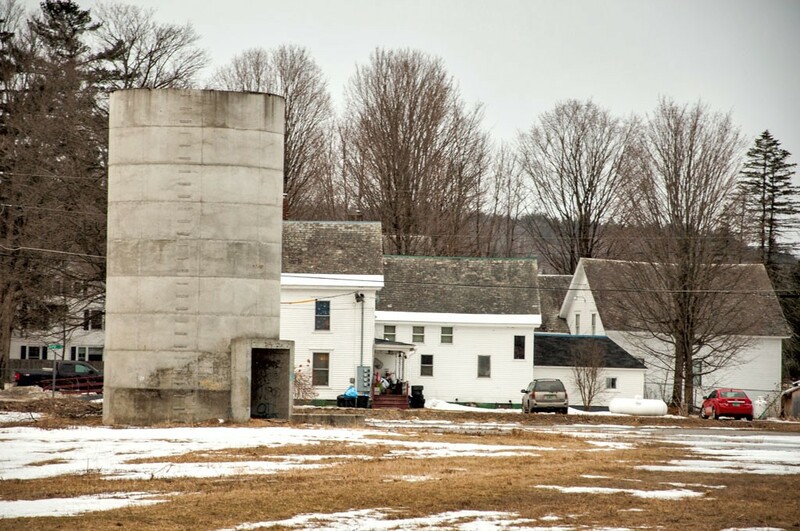 On February 27, the Cambridge Arts Council announced that it had received a $15,000 Animating Infrastructure grant from the Vermont Arts Council for "the beautification and art-implementation" of the silos. Opponents to the plan immediately emerged. The most vociferous voice of protest has been that of Jeffersonville resident Terri Blake, who wrote in an FPF post on March 16: "Anyone who believes that painting concrete silos with art is crazy. I believe that this is way [sic] of degrading our community by making it look like [sic] inner city. Who in this community will maintain the art when graffiti starts to appear on it?" Not every FPF post on the silo plan has been negative. Jeffersonville resident Nichole Roberge writes that she's "totally for the art," in part because "this town definitely needs some color." 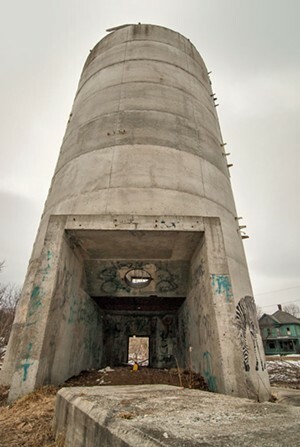 Melissa Manka, posting from neighboring Belvidere, compares the silo project favorably to urban-renewal projects in Montréal. Such comments are in the minority, though. Why not simply tear down the silos? some critics have asked. Furthermore, why is an arts organization in Cambridge determining the future of silos in Jeffersonville? According to the VAC's website, Animating Infrastructure grants aim to integrate public art into proposed infrastructure improvements. Michele Bailey, senior program director at the VAC, says such grants are not awarded on the basis of the intended permanence of the projects they fund. Rather, she says, their purpose is to spark community dialogue. "Any time you have a public space and public interaction with it, there are going to be opinions about it either way," Bailey says. "It doesn't surprise me that there's been a dialogue. I just hope that the dialogue creates something that the community can be excited about and proud of, whether it's temporary or permanent." Cambridge is one of five Vermont towns to be awarded a grant as part of the Animating Infrastructure program, which is in its first year. The other recipients are Stowe's Helen Day Art Center, the Poultney Vermont Historical Society, and the towns of Morristown and Shaftsbury. In the last two, the funds will be used, respectively, to install treelike sculptures in the downtown center and to build a visitor-friendly rest stop for pedestrians, cyclists and drivers. The Cambridge Arts Council's grant application — which has been posted in full online in response to the rash of negative comments — outlines its intention to beautify the silos to demonstrate to "locals and tourists alike ... that we care about our town, are proud of it, and that the arts are an important part to [sic] our community." But whose town is "our town"? The jurisdictional relationship between Cambridge and Jeffersonville is anything but clear, even to locals. Jeffersonville (population about 700) is a small, semiautonomous village within the larger Town of Cambridge (population about 3,500). Jeffersonville residents are thus in Cambridge, but Cambridge residents are not necessarily in Jeffersonville. On Town Meeting Day, residents cast votes in their respective villages, even though the one includes the other. Another example of muddied waters: Cambridge Elementary School is located in Jeffersonville. And the village of Jeffersonville is very close to owning the parcel of land on which the silos stand — after a lengthy contention over its future. When the lumber mill closed, the land was purchased by St. Albans-based Jolley stores, which currently operates 35 gas station/convenience stores in Vermont. Many residents objected to the company's plan to build a 16-pump gas station in the heart of the community, partly on aesthetic grounds and partly because the Cambridge-Jeffersonville area already had three such establishments. An even more pressing concern for many locals was the land's location smack inside the floodplain of the Lamoille River: A flooded gas station is a potential hazard. Every spring, the mountains of nearby Smugglers' Notch let loose their snowmelt. When the waters inevitably surmount the riverbanks, they spill into adjacent parcels, including the one on which the disused silos stand. On a sunny day last week, water was already coursing steadily across Route 15. In 2012, the village's campaign to purchase the land from Jolley was successful (though completion of the purchase is still pending). Jeffersonville received a $125,000 grant from the Vermont Housing & Conservation Board for that purpose, augmented by more than $200,000 in private donations and tax revenue. Why did the eight-person, nonprofit CAC focus its attention on the silos? CAC member Justin Marsh, who took the leading role in writing the Animating Infrastructure grant, explains that the silos assume many meanings for locals. "The railroad used to run right through here," he says, "and the lumber industry was pretty big for our town at the time." To some residents, then, the silos may represent the last visible link to the village's history. But for others, Marsh suggests, they're little more than "an eyesore." The idea to paint the silos, he says, was the best and most plausible one to emerge from a CAC meeting in September 2014. Those who oppose the murals have repeatedly raised a counterproposal: How about we use the money just to tear down the damn silos instead? But, as CAC members explain, this is not an either/or situation. The VAC gave $15,000 on the condition that it be used to fund a project of an artistic nature; the money is not intended for general infrastructure improvement — or, in this case, elimination. After several days of opposition in FPF, Kim Martin, a trustee of the Village of Jeffersonville, took to the forum to clear up a few misunderstandings. The grant's funds, she explained, are not drawn from residents' taxes, nor may the funding be used to tear down the silos, as some contributors suggested. The grant's dedicated purpose, Martin wrote, "is for incorporating art, not destruction of infrastructure." In any case, says Marsh, the demolition of the silos would not come cheaply, in part because the process would require cleanup of the surrounding soil, which testing has revealed to contain contaminants. The village trustees, who will have final say over the project, favor the mural plan, Martin tells Seven Days at Jeffersonville's Village Tavern. The CAC proposal was comprehensive, including plans for community input, floodplain management, and silo and mural maintenance, she explains. Martin also said as much on FPF, but some commenters appeared to ignore her. Calls for the silos' destruction persisted; multiple commenters changed tactics, suggesting that the CAC had overstepped its authority. Bailey of the VAC confirms the content of Martin's posts. She also notes that, while the VAC gets most of its funding from the National Endowment for the Arts, the Animating Infrastructure grants are funded entirely by private donations. In other words, no taxpayer money will be used for any of the five grant projects. Blake, a vocal opponent of the mural project, elaborates on her objections in an email to Seven Days. The murals will distract drivers, she contends, they might violate Vermont's anti-billboard law, and the CAC and Jeffersonville board of trustees have "overstepped their authority by not including our village residents in the decision-making process." Responses from CAC members and other citizens suggest that mural opponents misunderstand the nature of the grant and that process. Yet the debate rages on. On May 18, the Village of Jeffersonville will hold its annual meeting, where residents are invited to weigh in on the mural project. Should the proposal be overturned, the CAC will have to rescind the request for proposals that it issued last week to local artists. The silos could remain unpainted and the grant returned. As Bailey puts it, "This is a town decision." It's difficult to tell whether the mural debate indicates a deeper divide in this small community, or if it's just another example of cyber-incivility — even on a forum that doesn't give users the cloak of anonymity. CAC members remain optimistic not only that the murals will be painted but that the artwork will enrich the community. CAC president Carol Plante notes with a laugh that the organization's pro-mural members have taken on a nickname: "the Silo Sisters." It indicates their shared belief that the public-art plan is, more than anything, about "place making." She adds, "The Silo Sisters have gotten some great information from the Vermont Arts Council that helps us articulate why we think this is a great project. We're going to stay on a positive track and help to educate people in the community about the benefits of the project — and include them in it." To that end, the CAC has published a call for community input, both on FPF and its own website. "What words or images do you feel best represent our community?" it asks. As of press time, no suggestions have been submitted. The Village of Jeffersonville will hold its annual meeting, at which residents are invited to comment on the proposal to paint the silos, on Monday, May 18, 7 p.m., at Cambridge Elementary School. The original print version of this article was headlined "Tempest in a Silo"